Recent news and thoughts from the Vidals at Brightwood Vineyard and Farm. We're on the far side of Summer now; time to pause and give thanks for all the wonderful produce we have been enjoying- and for our excellent kidding and lambing season and our healthy flock of future laying hens. We moved the goats out to their summer pasture on the far side of Spring Branch (a small stream that runs through the farm) about a month ago. They have been feasting on all the grass there ever since- and taking care of some weed problems for us at the same time. Our final kid count is 23- all are doing very well. Their moms are still letting them nurse for short periods of time, but over the next month they will gradually wean the kids. The youngsters are spending some of their day playing, but are settling down more and more into the routine of the herd. Luke, our guardian dog is doing a great job- just like a seasoned pro, even though he still isn't quite a year old! Luke and the goats in the summer pasture. Our final count for lambs is 7, including 5 ewe lambs! We will keep all the ewe lambs, since we are building up the size of our flock. Leia (Luke's sister) has also been doing a super job as flock guardian and adjusted very quickly to working on her own. The Tunis lambs are a rusty brown color when they are tiny, but their fleece starts to fade to creamy white in a few weeks. Almost all of the lambs are the same color as their moms now. They spend part of each day just running around and generally enjoying life- what a pleasure to watch! Dean and two little helpers feeding the sheep. It has been a good spring for animal babies at Brightwood Vineyard and Farm. We began the season with the arrival of our Spanish Goat kids- all 23 of them! They love to run and jump from place to place, and 'king of the mountain' is their favorite game. Next to arrive were the lambs- six so far with probably one more on the way. Our Tunis lambs are always a rusty red color when they are born and gradually lighten in color to the creamy white of the adults. We were surprised when one of our first lambs was white with brown spots- not something we were expecting! The lambs are up and nursing within a few minutes of birth and following their mothers out into the field soon after- pretty amazing! Two weeks ago we received our day-old chicks in the mail. They traveled well and are growing by leaps and bounds. They have started trying out their new wing feathers by doing a powered run across their cage- pretty impressive! They will be moving to an aviary in our front yard this week where they will have lots of room to exercise, and grass and bugs to eat, too! For this year's addition to our flock, we chose buff rocks, white rocks and partridge rocks as well as some cuckoo marans. By next spring they will be laying along with our older hens. Our new guardian dog pups arrived at our farm in October of last year. We decided that since we already had an excellent guardian for our chickens (our Maremma, Ben), we would raise the pups, and begin their guardian dog education with Ben as their teacher. So, we built a moveable pen for the pups near our moveable chicken house. At first, when the pups were really tiny, they spent quite a bit of time in their pen, just getting used to all the chicken activity around them. Then, gradually, they spent more and more time out with the chickens- all the time under the watchful eye of Ben. He taught them to respect livestock- sometimes a very difficult job for energetic puppies surrounded by chickens! It was by far the easiest training period we have ever had- Ben was on the job 24/7! After Christmas, we decided that the pups were ready to go to work on their own- when they were only 4 months old! We moved them to our goat field, and they immediately figured out that their new job was to guard our goats. All of Ben's lessons about respecting livestock were transferred to the goats and the pups went to work right away. They got used to life with the adult goats over the winter and were ready for their really important job of protecting our Spring goat kids. Now, the goat kids are about a month old, and no longer in danger of fox attacks- soon, we will be moving the pups (who are both around 70 lbs. now!) over to our sheep field to prepare for the arrival of our lambs in a few weeks. It is really wonderful to watch dogs at work, doing the jobs they have been bred for. Our guardian dogs are important members of our farm team; without our chicken guardian, we would not be able to keep our 135 hens out on the pasture to range freely. Now we don't have to worry about fox or coyote attacks- those predators look for easier meals elsewhere. It seems that it has been about a year since our last blog post...things are pretty busy around the farm and it is hard to keep up with 'extra' things like blogs! But I am determined to try again to share our experiences here on a more regular basis. The winter was very mild with only a few nights below 20 degrees and only a little snow. It was the perfect winter for our first cold weather CSA (Community Supported Agriculture, where regular customers agree to buy vegetables from a farm for an entire season). We had a good mix of storage crops (potatoes, winter squash, sweet potatoes, garlic, onions), root crops (turnips, carrots), and greens (salad mix, Asian greens, kale, chard, etc.) 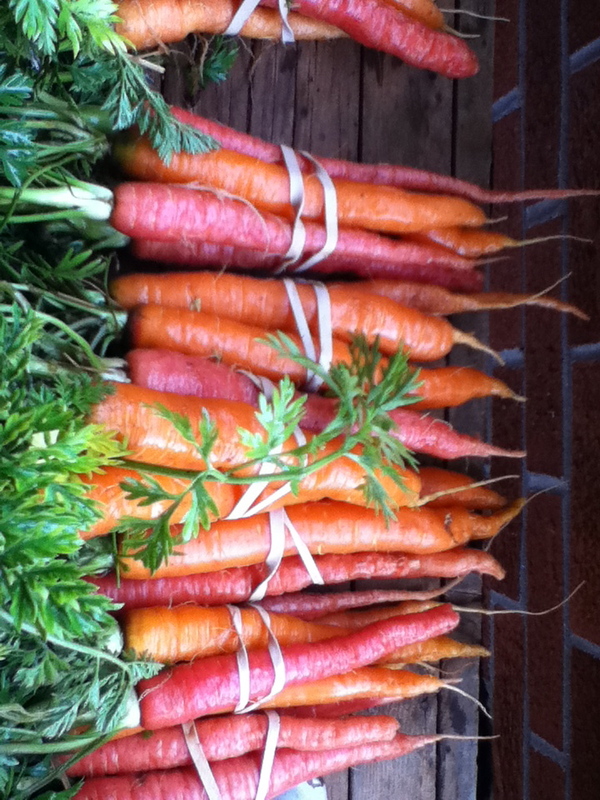 and made up a box of veggies for each of our CSA customers every week from mid November until the beginning of March. Here are a few of our boxes, lined up in the car port, ready for pick-up. I find that I really enjoy growing during the winter. Most of our crops are grown in our unheated hoophouses with some of the hardiest doing well outside under row covers. Even on a cold day, the environment in a hoophouse is warm and inviting. It is great to see all those green growing plants when the view outside is dreary and cold! We have already begun planting for next year's winter CSA- the potatoes are in the ground and looking good and we will be planting sweet potatoes and winter squash within a couple of weeks. 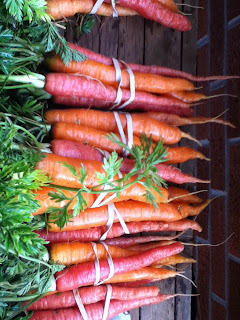 We wait until late July and August to begin to plant the other crops that will provide delicious vegetables all winter.